Are you tired of being tired? Do you rely on sugar and energy drinks to get you through the day? Do you have trouble winding down at night? Have you found that you don’t tolerate carbs as well as you once did? Have you noticed that you’ve been feeling a little blue or a bit more on edge lately? If so, you may have a “broken” body clock, and in this episode of the BioTrust Radio health and fitness podcast, we’ll cover all things related to healthy circadian rhythm, including what you can do to FIX yours. Enjoy! Listen to it on iTunes or Stitcher. Enjoy the show? Please leave a 5-star review on iTunes or Stitcher. 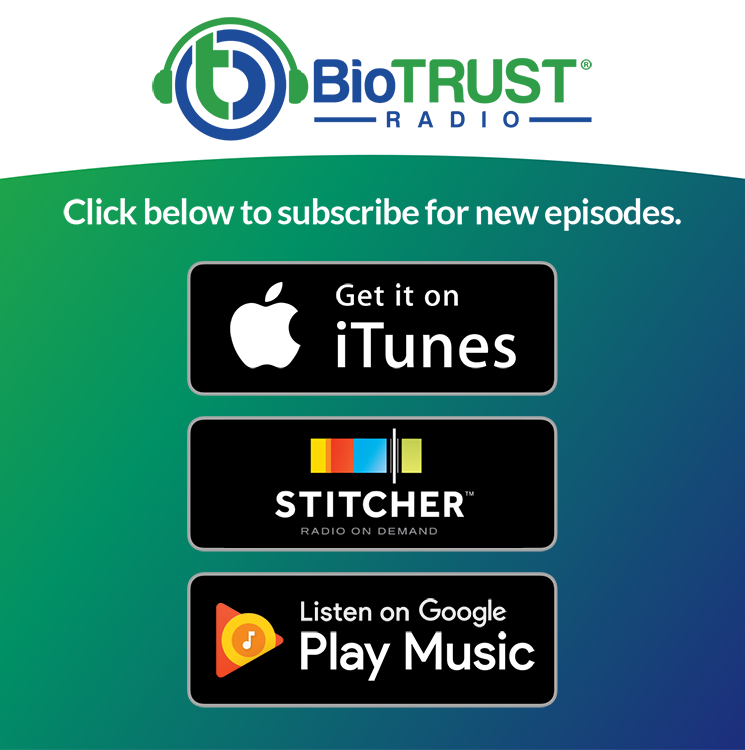 Don’t miss an episode of BioTrust Radio! Subscribe on iTunes or Stitcher. Have a comment or question on this episode? Comment below. Shawn: Welcome to BioTrust Radio with Tim and Shawn. We’re back at it again. We have a really good topic, circadian rhythm. What is that? Shawn: It really is a critical, I guess, determinant of our life and our health, our hormones, our neurotransmitters. We were just talking about this before that like all your organs have little circadian clocks in them. I mean, what is circadian rhythm? Tim: Yes, so circadian rhythm exists in all living things. And basically, it’s the body’s internal clock, like this 24-hour clock. Another name for it is the sleep/wake cycle. So, you can think of the circadian rhythm as the body’s natural cycle or the body’s natural internal clock. And there’s a lot of inputs and variables that can affect circadian rhythm, so we want to talk a little bit about those variables, but we also want to talk about why that’s so important. Tim: We want to talk about why circadian rhythm is so important. I think a good way to start talking about why they’re so important is to talk about what happens when they’re disrupted. So when this clock becomes de-synchronized, which a lot of people’s clock is de‑synchronized, what we’re seeing is increased risk for things like diabetes, obesity, neurodegenerative diseases, and mood disorders. So, a good example of a disrupted circadian clock is seasonal affective disorder. Shawn: Yeah, I have that. Tim: So what happens in those instances of seasonal affective disorder or winter blues, whatever you want to call it, is typically less sunlight exposure. Tim: So, you’re getting even less than normal. Shawn: Or it could be not just the winter, per se, it could be like that you live in Seattle which has the highest suicide rate in the country. Shawn: More gray days. It certainly affects us. Tim: Exactly. So, I kind of think that that’s an example of disrupted circadian rhythm. I’m not sure if that’s really borne out in the research or not, but I think it’s potentially a connection there because what you tend to see is an increase in melatonin at the wrong times of the day, so to speak. Melatonin is a hormone that is released by the pineal gland in the brain, and it’s highly affected by light exposure, so we tend to see the highest levels of melatonin in the evening. It’s often thought of as a sleep hormone. I don’t know whether that’s the exact best way to describe it, but it definitely facilitates the sleep aspect of the sleep cycle. Tim: Yeah. This is the master clock in the brain, and then we have all these other little clocks throughout our body. I kind of liken it to school, like an elementary school. There was a master clock in the school office and then you had clocks in each classroom. Now, just think, if one of those clocks in the classroom got somehow disconnected from the master clock. So you had a bell ringing throughout the building, but the bell wasn’t ringing in that classroom. It was a little chaotic. So when all these clocks weren’t connected, there was some type of chaos going on. So the same thing may happen in the body. That’s just kind of a brief overview of circadian rhythm and what could happen when it’s disrupted. But definitely there’s a relationship between sleep, quality of sleep, feelings of well‑being, energy levels throughout the day, digestion, lots of variables involved. So, circadian rhythm and circadian biology is important to everyone. Shawn: Right and if we take things back to primal days or our ancestral beginnings, there probably would have been far less issues with circadian rhythm displacement, if you will. And there’s actually, speaking of displacement, isn’t a work shift disorder, displacement disorder where you have your nightshift workers that are really bucking the circadian rhythm in terms of where it’s supposed to be, where we’re supposed to get up, and like you said, sleep/wake. And I believe there’s some data on it, and I’m and I’m spitballing here, but I think it’s like 10 years shorter life span for those that work that kind of way throughout their career. It definitely has an impact on your health and it’s not really something we were designed to do. Tim: Right. I think that shift work is even classified as a known or possible carcinogen. Tim: I may be incorrect on that, but I think that the health risks of shift work are so extravagant that it’s viewed in that light. And shift work is probably the best example of something that can disrupt your circadian rhythm, but also how disrupted circadian rhythm can impact health, so both ways. That’s probably the best example of something that can disrupt circadian rhythm and why that’s important. Another one would be jet lag is a really good example of disrupted circadian rhythm. So even traveling one or two time zones, I think it takes like a day or two per hour that you travel to really recover from that travel, and so the further you travel in time zones, the more disrupted your circadian rhythm are. Shawn: Yeah, absolutely. That a huge one. I guess, what’s a good way to approach this to prevent these issues from happening? Tim: Right. So, if we think about things that can disrupt circadian rhythm: shift work, jetlag, traveling across time zones. Those are two things that can definitely affect circadian rhythm. If you are a shift worker, I think there’s a more elaborate discussion involved maybe beyond what we’re going to talk about today. But for the average person, there’s a few things, to me, that come to mind is lack of the light exposure during the day; too much light exposure at nighttime, when we’re supposed to have less light exposure; and then just poor sleep hygiene is another one. Tim: And I think we’ll also get into things like what and when we eat, and how that can affect circadian rhythm. Shawn: Yeah, I was reading an article recently about sleep deprivation and just how sleep‑deprived we are, and how weird this is as animals that we do this, that we sleep deprive ourselves, intentionally. Shawn: It’s one thing if it’s like a survival scenario, but animals don’t do that. When they need to sleep, they sleep. But we will like, “Oh, I’ve got to stay up and watch this show. I’ve got to finish this binge watching on Netflix.” Or “I’ve got to stay up at this party. I’m going to power through.” And you wake up exhausted and you go through the day and you do all these things like get sugar and caffeine and whatever it is to power you through. And this is such an unnatural state of being that’s completely bucking like what the circadian rhythm, when your clock is telling you, “Look, you need sleep.” You’re supposed to get this sleep and it’s supposed to be on a very regular basis. That’s part of the sleep hygiene. It’s not supposed to be that you go to bed at 10:00 or wake up at 6:00 during the weekdays, but then on the weekends that gets thrown out the window. Shawn: That isn’t how it’s supposed to be right. And you actually had a term for this, I believe. Tim: Yeah, that was just recently introduced to me by a guy named Dan Pardi, who’s a brilliant researcher and just has done a lot of research on sleep, and even food intake and how it impacts weight loss, and things like that. Like you said, Shawn, we tend to have a very regimented scheduled during the week, but on average, most people sleep in on the weekend. They also eat that first meal then, subsequently, typically a little bit later. So, this shift of sleeping in an hour or so and eating an hour so later than normal leads to a little bit of a social jetlag thing. And there’s many reasons why I think people don’t look forward to Mondays, but I think it’s possible that this kind of jetlag then makes Monday’s even harder than it should be. We can talk about mindset on Mondays and things like that. But this idea of social jetlag, you’re basically pushing yourself into a different time zone. Shawn: So one thought I had that we talked about on the break that I’d like to bring up, and you said there’s actually someone who’s talked about this, which is cool because I was just theorizing about it because I love all things biohacking. I was thinking about the circadian rhythm and trying to do as much as I can to preserve it, like what we’re talking about having blue light exposure in the morning, maybe wearing blue light-blocking glasses in the evening and limiting my exposure to these screens that are emitting so much blue light. Especially if you’re in bed, do not look at a tablet or a phone. Just don’t do that, please. But maybe eating only during the daylight hours. And of course, this would be a smaller window during the winter and a larger window during the summer, and maybe during gray days, maybe you eat a little bit less. And maybe on really beautiful days you eat a little bit more. Shawn: And your eating kind of aligns with the amount of light exposure that you have. I think maybe you would connect yourself to the world in a way that—everyone thinks all this sounds so hippie—to be grounding or to be sunbathing all this stuff. People, we were not in these boxes with fluorescent lights up until like a hundred years ago. I mean, this is this is a weird thing and our circadian rhythm is set by daylight, is set by breathing in the air and moving around, and being exposed to nature. That is our environment. That was our true environment. We weren’t meant for buildings or fluorescent lights and parking garages and all these kinds of things, and malls. I mean, this is like a weird phenomenon. We’re kind of like rats in cages now. This isn’t our true environment. So maybe going back and trying to establish some of those things a little bit better could be helpful. And I don’t know, I haven’t done this experiment yet on myself, but I’m thinking about doing it. What do you think? Tim: Oh man, you opened up a big can of worms right there. There’s so much to take away from that. Let’s maybe save the light component for just a second because the food one is a big one, to me; especially because intermittent fasting has become so popular. And there’s a couple different types of intermittent fasting. There’s alternate day fasting, there’s fasting mimicking diet, there’s time-restricted feeding; all kind of fit under that umbrella, at least is my understanding of it. But time-restricted feeding is probably the most popular form of intermittent fasting that I see. And what this typically means is that you restrict your feeding window to four to eight hours over the course the day, on a daily basis. By and large, almost everyone that I’ve worked with that has used that or that comes to me talking about how they fast, they fast throughout the day and then have their food in the latter part of the day. Tim: Which is pretty normal. Like I was talking to you about some research where they looked at just a large cohort of people and they had them taking pictures of their food and the pictures were time-stamped so they could get an idea of when people were eating. The average person, their window of eating is like 14 to 15 hours, or at least in this study cohort. And they were eating like 40% of their calories after 6:00 p.m. So, most time restricted feeding people are eating their calories in the evening, which is pretty normal. But to your point, I think that there’s tremendous value to restricting your feeding to daylight hours. So, we go back to circadian biology. Tim: Yeah, exactly. Going back to circadian rhythm and the idea of this master clock in your brain, the SCN and then having all these clocks throughout your body, well, you want those clocks to be in alignment. Just like when you’re driving down the road, you want green light, green light, green light. You don’t want to go green, red, green, red. Tim: You want to keep going. You want everything to flow smoothly—in rhythm, circadian rhythm, that is—like clocks in your pancreas, so insulin secretion; clocks in liver, enzyme secretion; clocks in the digestive system, so digestion and absorption. Everything’s working properly there and aligning with the body’s master clock. Tim: So I did see one study, in humans, where they did a time-restricted feeding study and some people ate breakfast, some people skipped breakfast. And when I’m talking about breakfast, you could say technically breakfast is the first meal of the day no matter when you have it, but for purposes of this conversation let’s say breakfast is like your first meal in the morning, just so there’s some clarity there. I’m not saying I agree with that, that’s just for the clarity of this conversation. Well, the people that skipped breakfast and then didn’t have the same first meal until the afternoon actually had poor carbohydrate tolerance or a worse glycemic reaction to that same meal. So, it’s hard to say. Is it trainable? If that’s the way you eat all the time, does that change? I don’t know. Tim: I think there’s enough evidence there to suggest that exactly what you’re saying, that we should probably eat most of our food, if not all of our food, during daylight hours. And Satchin Panda has done a lot of research in this area and they saw that people that restricted their feeding window to 10 hours during the day—so they stopped eating at like 6 p.m. or so—they showed improvements in several different biomarkers and lost weight as well. Now there was some decrease in calorie intake, which if you think about it, but no matter when you do time-restricted feeding, you would expect some decrease in caloric intake. But this this was a particularly interesting study because the timing of it, I thought. So, I do think that there’s something to that, and so that your organs are timed up with your master clock. I like that. I hope that you do experiment with that. Tim: But I would encourage people, and I, myself, have advocated that it doesn’t matter when you eat, it’s just a matter of amount of calories. I am personally rethinking that, myself, because I do think that timing may matter when it comes to circadian rhythm. Shawn: Well, what about the six small meals, six to eight small meals a day. Ten years ago, everyone was like, “You need to graze. Keep your blood sugar more stable. This is the best thing you can do for fat loss. Eat six to eight small meals a day, like you’re grazing.” But then now it’s like, “Okay, intermittent fasting is here,” and eating one large meal maybe and having improved insulin sensitivity, more growth hormone released, may be aligning better with your circadian rhythm. All this kind of stuff. We’re hearing more about this now. Then even like we were talking about before, that can actually help with optimizing muscle protein synthesis, that you get one big protein bolus, right. And if you’re just grazing, especially if you’re older and less active, then you’re never optimizing muscle protein synthesis, which means the anabolic phase where we’re protecting and adding to potentially lean body mass. I mean, what do you think about that? Tim: Yeah, well I think it’s interesting for a couple of reasons. One, because I think that we were brainwashed almost to think that six to eight meals was optimal. And the reason why we were told that was the case was, like you talked about, like the protein synthesis kind of stuff. I think that probably stemmed from like very acute types of studies. I don’t know that if you were to compare six to eight meals versus one meal or two meals or three meals, even. Shawn: I definitely think that’s the case. Tim: Over the course of a long period of time, whether that would make a difference. Or like to your point, it might even be better to have fewer meals with larger amounts of protein. Tim: But I remember hearing that and it was always advocated to me to boost metabolism. And then if you missed a meal, your body was going into starvation mode. That’s a bunch of garbage. Shawn: I’m going catabolic! Yeah. Tim: It’s not true at all. In the grand scheme of things, the amount of calories that you consume, regardless of the number of meals, if the food composition and the calories are the same, meal frequency doesn’t matter in terms of how many calories you burn to digest that food. And the other thing with like going into starvation mode with skipping a meal here there is completely false. I think it takes like 72 hours or even longer before metabolic rate starts to decline; 72 hours of fasting. Shawn: Yeah, because ketones can be elevated during periods of fasting. And then we know that ketones are leucine-sparing or muscle-sparing, so they’re very anti-catabolic. BHB, which is the key ketone, might even be anabolic, based on some new data. So, it is interesting what happens. And a lot of people are pairing up, potentially, ketogenic diet with intermittent fasting, this time-based caloric restriction, like you were talking about. And then we know that also caloric restriction has been studied for a long time—CR, you can look that up. As far as being anti-aging and what do you think about that impact? There’s these SIRT genes and then there’s telomeres, kind of like these little shoelaces that when they’re unraveling where basically it’s the clear direct sign that we’re aging. Shawn: So what do you think about anti-aging and maybe intermittent fasting, caloric restriction, etc.? Tim: Yeah, that’s a great question and great segue there, Shawn. One other thing that I was reminded of, about going back to circadian biology and food intake and the metabolic response to the food we eat. So, the thermic effect of feeding refers to this component of metabolism that basically whenever you eat, you burn calories to digest and absorb it and all that kind of stuff. The thermic effect of a meal is higher in the morning. Tim: Than it is later on in the day. So another reason food timing is connected to circadian rhythm. Shawn: Another reason to maybe start your eating earlier rather than later. Tim: Exactly. So to your point about the fasting, yeah, caloric restriction is definitely one of the best anti-aging weapons that you have at your disposal. I think you’re familiar with the fasting mimicking diet, right? Tim: That is probably one of the more effective ways to mimic caloric restriction. Because caloric restriction involves like 40% reduction in calories every single day. Shawn: Right. And that can be difficult. Tim: Exactly. Like forever. I’m talking about just a few days here and there. Whereas, the fasting mimicking diet is basically taking five days out of a month where you reduce your caloric intake. I think you’re eating about 35 to 40% of your normal intake on those days. It’s a lower protein diet, but you still get to eat, and it’s just like five days out of a month. And it seems to have the same anti-aging types of benefits as caloric restriction. I think you could make an argument for the ketogenic diet, and especially like you advocate ketogenic diet with time-restricted feeding, or even alternate day fasting having similar effect. Shawn: With whole food, ideally, instead of processed foods. That would be a big factor. Shawn: So I like the Paleo, Primal, whole food, Whole 30, ancestral diet or whatever. All these kinds things that are that are happening now that like get us back to just eating real food versus stuff out of a bag or a box, or whatever, with all the 600 ingredients that we read. I mean, what else about circadian rhythm would you like to bring up in terms of our health and how critical it is besides sleep? What is it we’re doing maybe during the day that can affect our circadian rhythm? Tim: Yeah, that’s a good one. I think one of the biggest factors governing circadian rhythm is light and our exposure to light. So, probably blue light exposure at night is certainly a big one, and that’s the one that gets a lot of attention. We’re going to talk about that one in a second, but I think that the biggest thing is not getting enough really bright light at the beginning of the day. So, sunlight, basically, to set the clock every day. I think that if you were to take away one thing from this conversation on circadian rhythm, in my opinion, it would be first thing in the morning when you wake up and the sun comes out, get outside in the sunlight for at least a few minutes. Maybe make yourself a cup of coffee, sit out there, breathe in the fresh air, and just let yourself expose to the sun. Shawn: Or use a blue light device. Shawn: If it’s gray out or you don’t have access to the sun for some reason. Tim: Yeah, exactly, Shawn. And I think bright light therapy, like you were saying, that’s a proven way to treat seasonal affective disorder. So the reason that it’s important to do an actual bright light therapy in an office setting like this doesn’t work is because the magnitude of light, the blue light, that the sun or this bright light therapy is giving off is like hundreds of thousands of lux, which is a measurement of light. Whereas this is maybe a couple thousand or something like that. So, the magnitude is significantly greater to be outside in the sunlight or to be in front of these bright light boxes. Shawn: Plus we know about blue light, but we don’t know about all these other wavelengths of light that are being emitted. This radiation from the sun, but all these different frequencies, these wavelengths, we don’t know all the impacts of all this cosmic radiation. It’s just fascinating. I think there’s a whole future of studying all that kind of stuff, how it impacts us and our health. I mean, it might be like just as important as “take your multivitamins,” so you get all these vitamins and minerals that are required for your health, so too, may light and all these different wavelengths be in the future, like “You need this infrared.” Like these infrared saunas, for example. That’s becoming obviously a big discussion point for your health. So, infrared, I think they’ve shown improves blood flow and decreases inflammation and all these kinds of things. It’s interesting, again, people think, “Oh light. That sounds so hippie. I don’t understand it.” But again, we were supposed to be outside. Tim: Agreed. And I think that just going back to that extreme example of seasonal affective disorder and the lack of sunlight exposure that most people are getting at that time, it shows to me that it’s pretty strongly related to the poor mood states that people would experience during then. You use an actual blue light device, don’t you? Shawn: And it fits in your ears and you actually have photoreceptors in your ears, which I actually think is interesting. I know there’s issues with circadian rhythm for blind people, but maybe this is like some evolutionary protective mechanism or something. Your photoreceptors for blue light are in the corners of your eye, but also not too far away, if trace that corner of your eye to your ear is photoreceptors in your ears. So that’s a very interesting thing. Maybe lay on your side if you’re laying down and getting some sunshine and you can get more of that direct light into the corner of your eye and your ear. So these human chargers actually look like a little earpod things that you stick in your ears and it just shoots super bright light at these photoreceptors. And it really works. Tim: And it sounds like it’s a good tool, like you said, when you travel; especially traveling across time zones, can help you maybe transition faster—help you maintain circadian rhythm. And that also reminds me of intermittent fasting. But if I’m correct, it really got its start from helping people transition from jet lag. Tim: The people would fast from the time they left. Let’s say they were going eastward where time would go ahead. So they would be coached up to have their first meal at the normal time in the new time zone, and that would help them transition. To me that goes to show. Shawn: It’s more proof that meals are actually part of your clock in setting that circadian rhythm. So, maybe it’s not just sleep hygiene. We need circadian hygiene. Shawn: Or we need dietary hygiene. Shawn: Like these things are all like markers that are setting things in motion. Shawn: Cool. Well this has been a phenomenal show. And I’m really glad, again, like people are supporting the show, listening to us. We’re Shawn and Tim. We’re here at BioTrust Radio for you to take your topics. We’re going to do a show coming up of answering all the questions that have been thrown at us on our Facebook VIP site. If you go on facebook.com, look up BioTrust VIP. You can put your questions up there and we’re going to answer them. So we’re going to hit that next. I’m pretty excited. Tim: Yeah, that’s awesome. And if we do pick your question, we’ll actually give you a free product, too. Shawn: Oh, come on. Come on now, people. Tim: Get smarter, get coached up, and you get free BioTrust products. Shawn: All right. Great show, Tim. Shawn: Thanks everyone. See you. What is Your Favorite Position (sleep position, that is)?